Today was an exciting day! We headed to Korle Bu Hospital bright and early and immediately started seeing patients. We saw many new and some old faces as some of our previous patients came back for a second or even third day of therapy. Throughout the day we continued to work with patients with autism, language delay, articulation disorder, hearing impairments, vocal fold paresis, and patients who have suffered from a stroke. We were then whisked away to go see a cleft palate surgery in small groups! Dr. Ampomah, head of ENT at Korle Bu Hospital, warmly welcomed us into his operating room and we stood elbow to elbow with him as he operated! 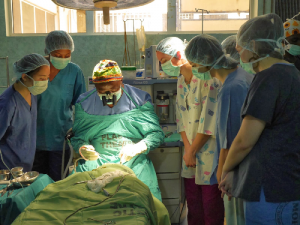 During the surgery, Dr. Ampomah made sure to explain the process and his every step. We eagerly looked on and excitedly recognized various structures and anatomy of the mouth. This was a once in a life time opportunity that we will always remember! After our busy day at Korle Bu hospital we headed to a local Ghanaian market in Accra to do some shopping. We ended the day with a talk from the famous Albert, one of the amazing SLT’s we work with in Ghana, and his son Pius. Albert shared his story about becoming a speech language therapist, while Pius discussed both the challenges and rewards of being a doctor in Ghana. Afterwards, we reviewed cleft palate to prepare for our exciting day at the cleft palate conference tomorrow! Thanks to Eleni Gkikas and Allison Lekich for the post.